President Muhammadu Buhari congratulated Oyo Alaafin, Oba Lamidi Adeyemi 111, on his 80th birthday. Special Advisor to the President for Media and Public Relations, Femi Adesina, announced the President's message of congratulations in Abuja. Mr. Buhari joined the Obas and Chiefs Council in Oyo State, the traditional council, family, and friends of the Alaafin of Oyo, heir to the historic Oyo Empire, to celebrate the milestone era. The President expressed the conviction that the 48-year-old Oyo King had been remarkable on the throne of his fathers for the entire dynasty. According to him, this is illustrated by Alaafin's contribution to the educational, social and cultural development of people both at home and abroad. 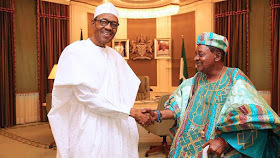 Mr. Buhari praised the courage of Oyo's Alaafin to defend the values ​​of integrity, hard work, and the search for knowledge that had been the hallmark of the great Oyo Empire. He also praised him for regular advice from governments, institutions and families. The President prayed that Almighty God would give the Royal Father a longer life, good health, and more wisdom to preserve the legacy of his fathers.